One of the things I love about teaching with a classical approach, is the integration of subjects. As a Christian classical teacher more specifically, I love teaching about how God is integrated into every subject. God being "integrated" into my child's subjects though, is not an accurate statement. Rather, it is about how every subject shows us a different aspect of Gods creative work and mind. God IS the subject and the names and categories we apply to His revealed knowledge of Himself are the disciplines we call history, geography, science, math, language arts and more - which really are just His methods of creating and communicating. 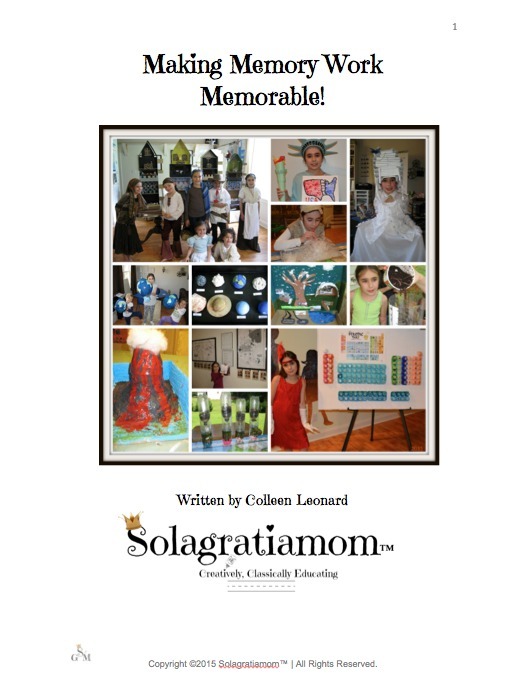 If you're in the grammar stage, I firmly believe that now is the time to be training your eye to see how subjects integrate and be naturally pointing it out to your child over and over again, so they can begin to see how these subjects reveal God to us. God is raining down on us, the revelation of Himself. His creative methods, blocks, order, evidence, and working, show us that each subject can not be taught apart from one another but rather, they are woven together -dependent upon some aspect of one another. 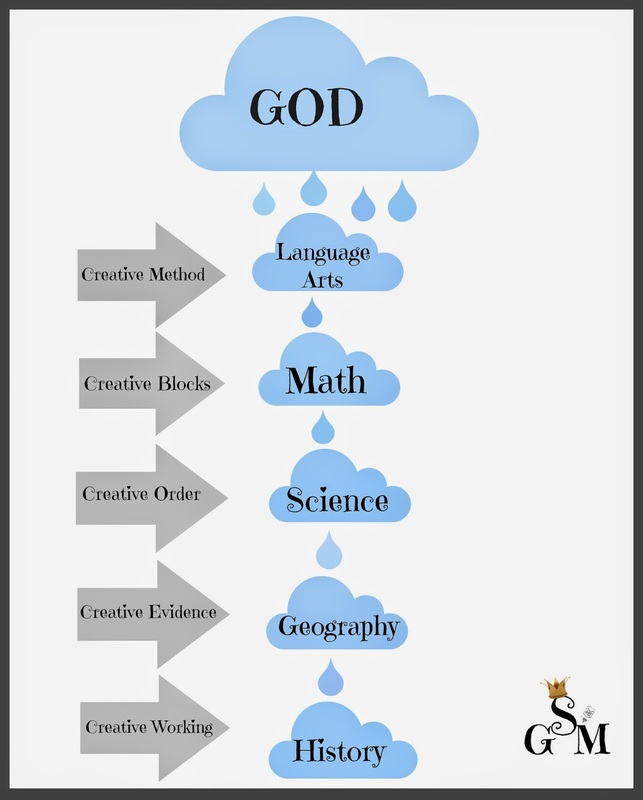 If I see Language Arts as the Creative Method (God spoke and it came to be), Math as the Creative Blocks (everything is built upon math - everything! ), Science as the Creative Order (the "how" of God's creating), Geography as the Creative Evidence (God's tangible creation and chosen location to work out man's redemption) and History as the Creative Working (we see God's working story of redemption played out as He spoke it would be) - then none of these subjects can stand alone. So where is God in all these subjects and how do they inter-relate to one another and more importantly reveal Him? If you are like me and didn't have the benefit of a classical education yourself, then this may not come natural. You have to train your eye and mind to begin to see and think about the connections. Let me share with you some of the ways I'm training my eye and my children's to see Him. This is where God starts and this is the creative power of God. In the KJV Bible the phrase "God said" is used 582 times. In Genesis it is used eight times referring to God's work of creating all we know. That's it! He just "said" and it came forth and was created through the power of His words! We can see that Jesus is referred to in John 1:14 as "...the Word made flesh..." We are also told throughout Scripture that everything is according to God's "word". The study of language, be it English, Latin, Greek or others, is really the study of God's creative method. He came up with the idea of language and words and the diversity of language was His idea and doing (refer to the Tower of Babel - Genesis 11:6-7). We can talk about the power of language when we teach it. Proverbs 18:21 tells us that "death and life are in the power of the tongue..." So while we may not be able to "create" as God did with just our words, our words still are powerful when they impact those to whom we speak. We are told in 1Timothy 4:12 to show ourselves to be an example of those who Believe by our "speech". We also are told to study the Word of God - hiding it in our hearts, which we can't do if we don't know how to understand grammar and read. There are many ways you can see why the study of language, reading and grammar all reflect God and His revealed will for us. I see math as the creative building blocks of all God has made. Once you see math, you see math! It's everywhere and it's inescapable! You can't have a baby, pick a flower, catch a butterfly, cook a meal, use your computer, be on time to an appointment or drive your car without math being involved in some way! God chose math to be the creative building blocks. When you see how He used DNA as the cornerstone in the building of a human body, patterns and Fibonacci numbers in the making of a flower, symmetry in a butterfly, measurements that are needed to make a meal, coding that goes into computer programming, constancy of time or the mathematical engineering that goes into designing a car - you see math! It's all from Him and the essence of how He creates! He uses math to an extent that we can't even begin to comprehend. Just to imagine that infinite numbers to us are finite to God - He can understand them like we understand 2+2=4 and He created them and we have to call them infinite because they are so large and beyond our understanding to even be able to categorize them as anything other than infinite! I see the study of math as the study of God's mind. The more my children can understand math, the more they can understand God - how He creates, how He thinks, how He orders and how He sustains. I love in Job 38 how God speaks to Job and much of his language is mathematical in discussion of the creating He's asking Job if he was present for -asking Job questions like "Who set its measurements?". I ask my kids often what math they see in things - all things - because there is likely math in any and everything you see - you just need to look for it. If we find a bug, we discuss the features of the bug and then we will talk about the math - how was that bug created and built? What math did God use to "build the bug"? Symmetry, shapes, counting, patterning, etc. It's there, just train yourself and your children to see it. This is for me the creative order of God. It's the revealed evidence that is visible, tangible, traceable of God's power. We can sort of "take apart" for lack of better words, God's creative order of things and get a glimpse into how God "builds". We can see what steps it may have taken for God to bring something to be or how God's creative order combined things. We can also combine things God's created (like chemistry) to "create" or change into other things. We can see natural processes that communicate spiritual truths as well. If we look at anatomy sciences then we can see the creative building blocks (math) and the creative order (how God brings them together and sustains them) of those blocks in the design of the various features of the body. If we look at chemistry, we can see the creative order of the blocks and then combine those blocks to see new creative orders beyond those. If we look at astronomy we can see the creative order that sustains and reveals a powerful, omniscient God and begin to grasp the magnitude of His existence and the minutia of ours. Physical sciences help us see the result of God's spoken word (what He created) and the geography that's referred to as key points in the Bible's history both past and future. Physical sciences also reveal to us the creative beauty of God's artistic mind (the diversity and uniqueness) and His might (tallest mountain ranges, raging storms, deepest oceans). What breath taking creative evidence of God! Geography shows us the end result of God's spoken words in creating, the mathematical building blocks God used to create, the scientific order and sustaining power over his creation and it culminates into the geography we can touch and study. Geography also gives us the important locations in God's revealed Word regarding past and future prophecy. Geography shows us the creative mightiness of God. We can use science to study geography, math to quantify aspects of the earth and heavens, and language as we look to God's word regarding important locations in the Bible to God and ultimately His people and plan. We can look to Israel, Golgotha, Megiddo and more - God has areas of geographical importance concerning His plan of redemption that we can analyze and study to understand His plans and methods better. We can look to all that God has made and see the enormity of His ability - from weather to space -it all shows His awesome power and creativity! We are told that this "evidence" leaves man without excuse. We can look to History and see His creative working out of His Word. "His story" being played out over the years and existence of mankind. We can see the evidence of man's fallenness and God's faithfulness. We can look and see how He communicates with us, rewards and disciplines, fulfills prophecy, brings to fruition His plan of man's redemption - it's all there. We can see the depravity of man's heart and the grace of a good God. It shows us how God interacts with His creation. We can see how the battle rages and yet the patience of God and faithfulness to bring to pass what He has promised is steadfast. History shows us much about ourselves and God. It's a study that requires geography as we see where major events in history have or will take place, science as we see the revelation of history through archeological discovery, math as we see the time periods and numerical significance in events and periods of history, and of course, language arts as we study history with God's Word both past and future. History culminates God's creative method, blocks, order and evidence! I hope this helps you to think more creatively classical about the subjects you are teaching at home and encourages you to come up with your own connections between subjects, as God reveals them to you in your study. Be blessed! We are learning to view life through this lens, and I have CC to thank for that. I'm also reading Saving Leonardo, and I just read about this particular thing last night. Academic disciplines cannot be separate from God -- it's just like the wheel they show us in CC. Thanks for linking with Collage Friday! Wow! What an amazing new perspective you have given me! Thanks so much for sharing at FF! My daughter Bethany often asks me how God made her. I always tell her that God thought we needed a Bethany so he just said your name and out you popped! It is beautiful, isn't it?! I love how you talked about learning these things as well as teaching them to kids! Can you imagine what heaven will be like when God's order, beauty, creativity, etc. will be shown without the shadow of sin? I love the connections and tying everything back to God. Classical education is a beautiful method to educate children.